I am writing this as I’m sitting in my living room, which also happens to be my kitchen, office, bedroom, workshop, game room, lounge, and oh yeah, my vehicle. I am a vandweller. Meet Tantor, he is my van, my house, my best friend, and sometimes a huge pain in my rear. 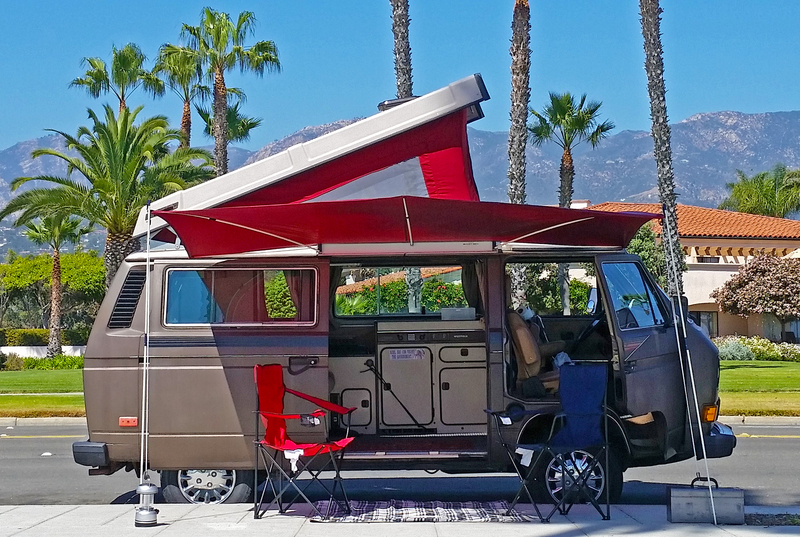 Tantor is a 1985 Volkswagen Vanagon Westfalia Campmobile. I bought Tantor in March of 2015 to replace my first vanlife home, The Silver Bullet (a 2006 Honda Element adventure-mobile). Of course, you may be wondering “Why?” Why in the world would I want to live in a van full time? What do I do for a bathroom, showers, and laundry? 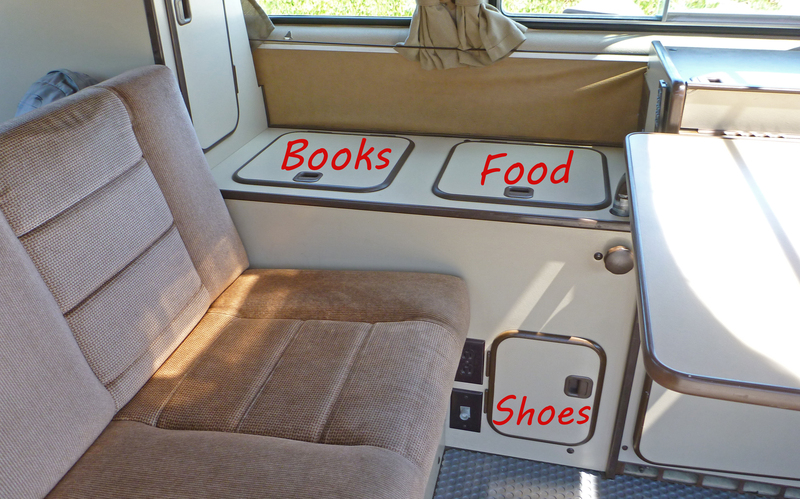 All are great questions, and all are answered in my previous vanlife blog post here. The relationship I now have with my real life Tantor is depicted perfectly in the second chapter of the book Jungle Tales of Tarzan. In the years of their association Tarzan had discovered that he possessed an inexplicable power to govern and direct his mighty friend. At his bidding, Tantor would come from a great distance—as far as his keen ears could detect the shrill and piercing summons of the ape-man—and when Tarzan was squatted upon his head, Tantor would lumber through the jungle in any direction which his rider bade him go. It was the power of the man-mind over that of the brute and it was just as effective as though both fully understood its origin, though neither did. My van resembles Tantor in many ways, most noticeably, he is big, brown, and slow. Volkswagen Westfalias have never been known for their speed, which should help me avoid tickets for the foreseeable future. While lumbering through urban jungles I stick to the slow lanes, especially going uphill when the speedometer struggles to hold a steady 40 miles per hour. Flat highways or downhills allow Tantor to chug along, but as soon as the needle tops 60 miles per hour my side mirrors droop, much like the large ears of fictional Tarzan’s African elephant. No, he’s not speedy, but that’s the point. This whole vanlife adventure is about slowing down, enjoying each moment, and moving at the speed of life. The first thing I did when I bought Tantor was move in. What does a vanlife relocation look like? Well, I parked The Silver Bullet and Tantor side by side at the beach and began the 30 minute process of moving everything I owned from one home to the next. No moving trucks, no boxes, no stress, no sweat. 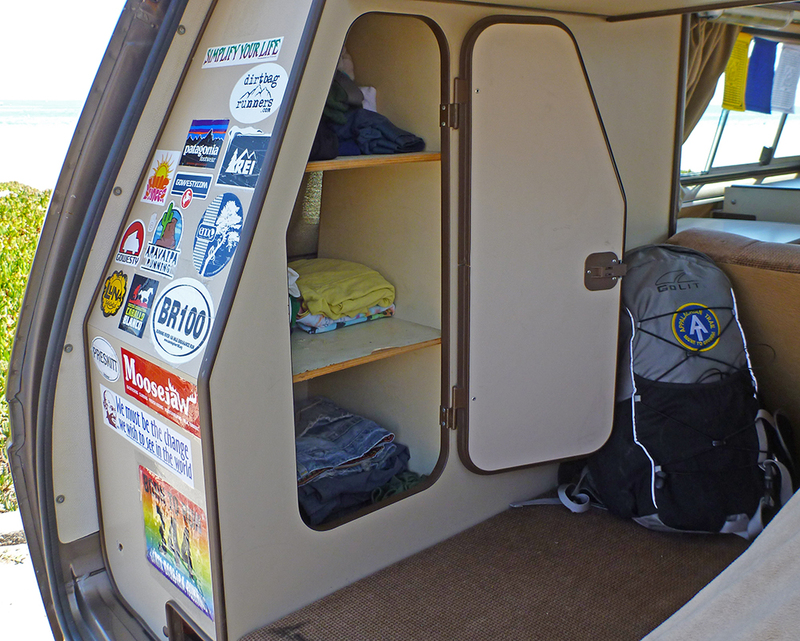 When it was all said and done I sat in Tantor, my new mansion, and gawked at how much extra space the Vanagon offered at 80 square feet compared to my old digs in the Element, just 35 square feet. The only problem was that I now owned 2 homes in Santa Barbara, California, one of the priciest zip codes in the United States. Granted, the resale value of my 2 homes combined doesn’t even scratch the surface of a down payment on a brick and mortar house on the American Riviera, but it is amazing what you can say when you adjust the definition of “home”. I began the process of selling my first home in favor of the second. I took the Honda Element for a smog test and the mechanic said, “Ah, your Honda has lots of miles”. I replied, “Yes, but it’s been a great car!” He said, “Of course, it is a Honda.” I answered, “Well, I’m trading this for a 1985 Volkswagen van!” He looked at me, shook his head, and said “Not smart my friend…” I drove away, rationally agreeing with him, but realizing that if everyone always did the “smart” thing in life there would be no dreamers and this world would be a very boring place. Living in a Westfalia is nowhere near as stealthy as living in a Honda Element. When I draw the curtains and park on a street at night everyone knows that someone is sleeping in the van. Of course, it’s always best to set up camp in the woods where I can pop the top, open the canvas windows, and not worry about getting a ticket for sleeping on the street. Well, I guess it’s time to invite you into my new house! Step on into my 80 square foot home for a tour! This is my front yard, or rather, one of them. The beauty of living in a van is being mobile. Cloudy at the beach? Head to the mountains. Too hot in the mountains? Cruise to the beach. Winter moving in? Drive to the summer. Freedom. And I don’t even have to mow the lawn! My living room, kitchen, office, game room, and bedroom. 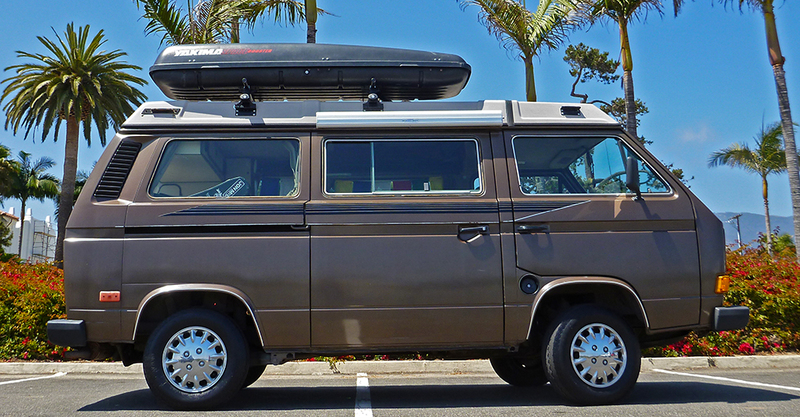 The Westfalia is incredibly liveable. I have a kitchen, closet, storage, seating for 4, and sleeping for 4 (well, sleeping for 8 if you are an Appalachian Trail hiker). It’s a mansion on wheels! 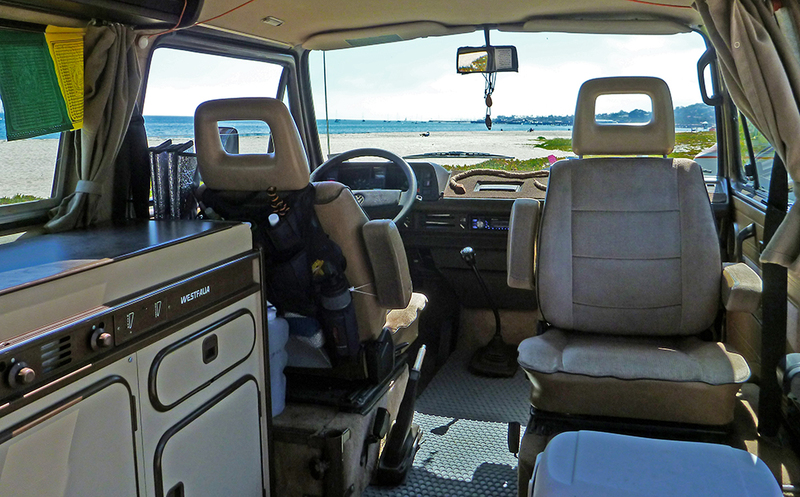 When the van is parked the front cabin turns (literally) into a living room. The driver’s seat can swivel 90 degrees and the passenger’s seat turns the entire way around. The table can be moved to the front so that two people can share a meal looking out the large windshield, or the seats can be turned inward to welcome a few friends over for a party. Working kitchen, complete with Fireball. 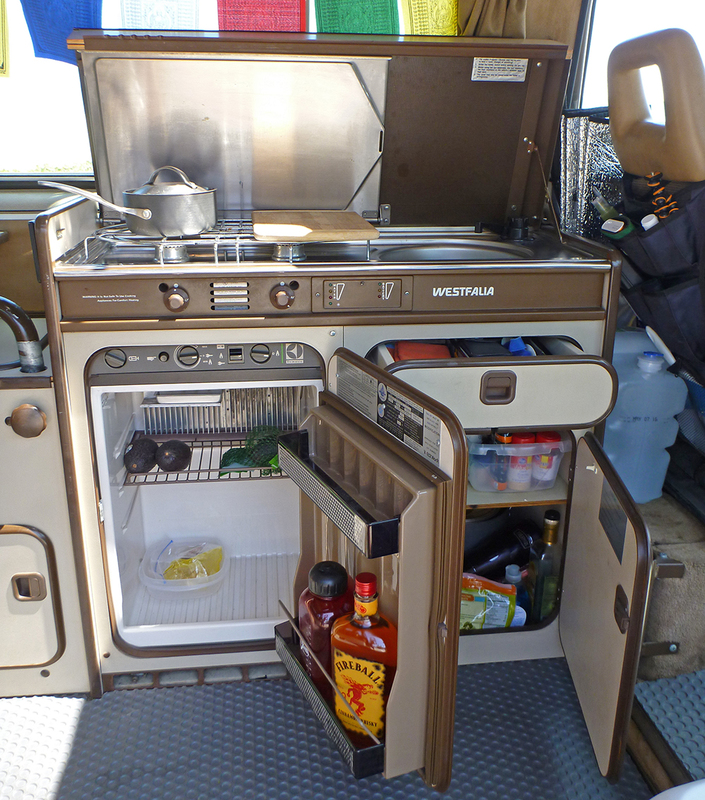 The kitchen sits directly behind the driver’s seat and includes a 2 burner propane stove, a sink with an electric water pump, a propane refrigerator, and food storage. Note, Fireball whiskey does not come standard, that is a custom dirtbag upgrade. My living room includes a love seat, perfect for parking under a streetlamp and curling up with a good book at night. The table swivels out and is large enough to prepare food for cooking, or open a laptop to do some writing and editing while watching the sun set over the Pacific Ocean. The Westy has ample storage beside the couch. I currently use the lower cabinet for my shoes and laundry detergent, strategically placed together to mask the smell of well worn running kicks. The table stows above two large hatch storage bins, one I’m using for food storage, the other for books, random items, and hats. The closet is large and easily accessible and houses the few remaining “nice” clothes that I’ve been holding onto, although my outdoor gear is quickly overtaking the professional clothes that I used to own. 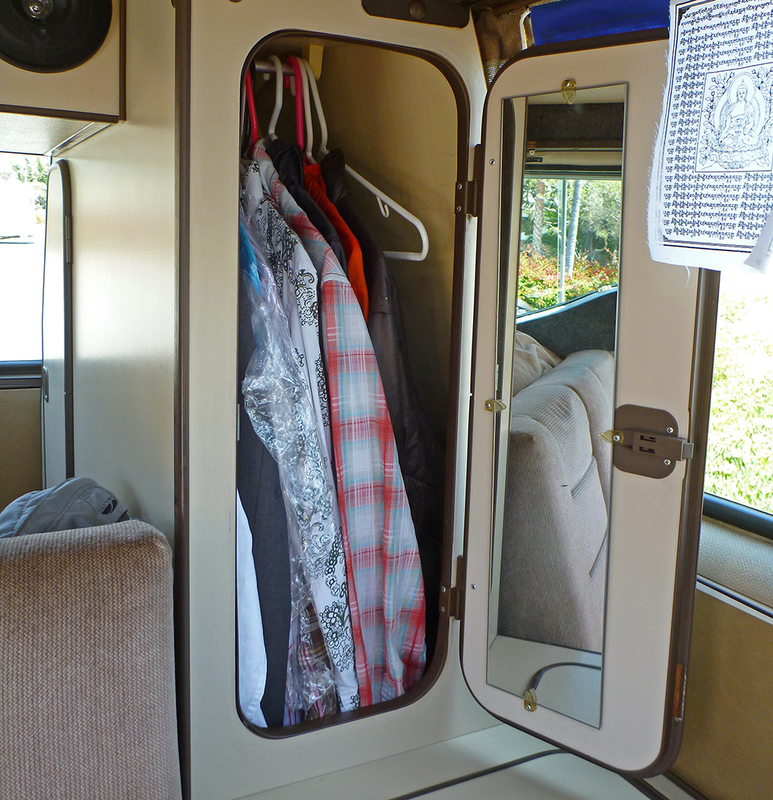 The closet door comes with a large mirror that I rarely use…I mean, I’m living in a van…really, who am I trying to impress? 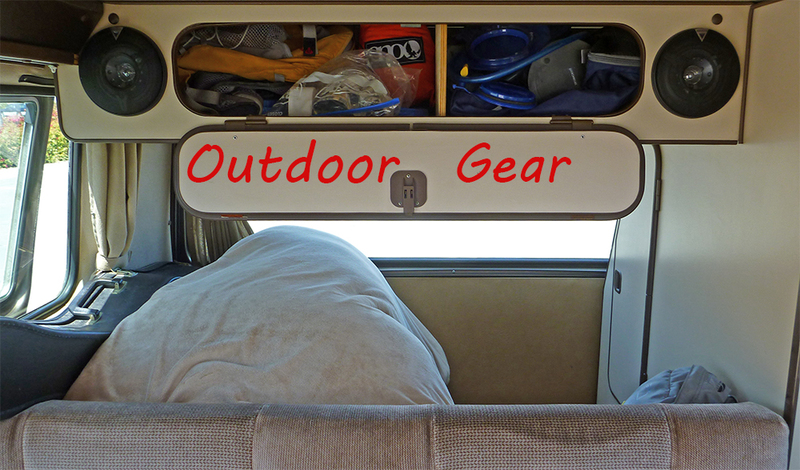 Above the couch is an overhead storage shelf that I’ve filled with my outdoor gear. Hammock, slackline, climbing chalk, running hydration pack, camp lantern, yoga mat, and bug net for the rear hatch. The back of the van hosts my “dresser” where most of my clothes reside. I’ve had trouble filling this because every time that I do laundry I look at the unworn clothes and typically decide that if I didn’t wear them, I don’t need them, so I take them to Goodwill. The lower bed, for urban stealth camping. If you read my post about living in my Honda Element you will recognize that the Westfalia offers a huge upgrade in the bedroom. The loveseat in the back folds flat for urban stealth camping and is way more space than I need. This is okay though, as my guitar has found a permanent home next to my bed. 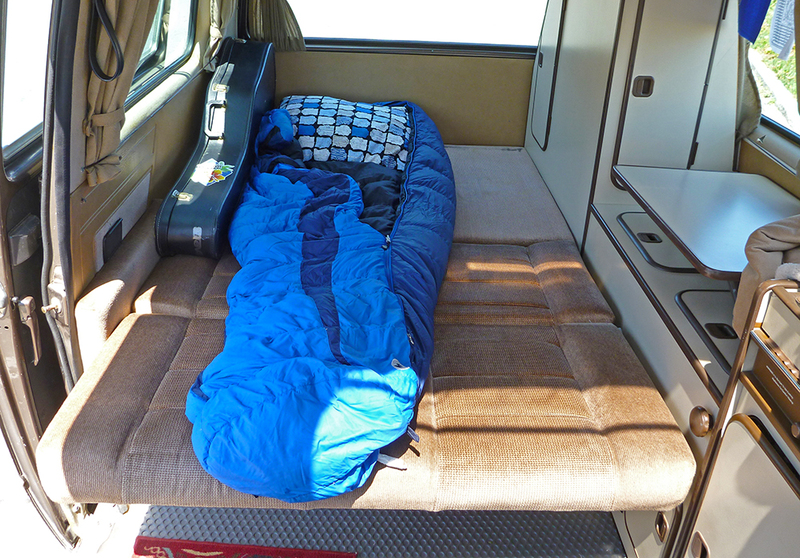 I have sheets and blankets in the van, but I typically prefer to zip into a sleeping bag. Most nights I am able to crack the windows and open the roof vent for great ventilation. When outside of town I pop the top and a large platform folds flat for an even larger bed, then I’m living like a king! 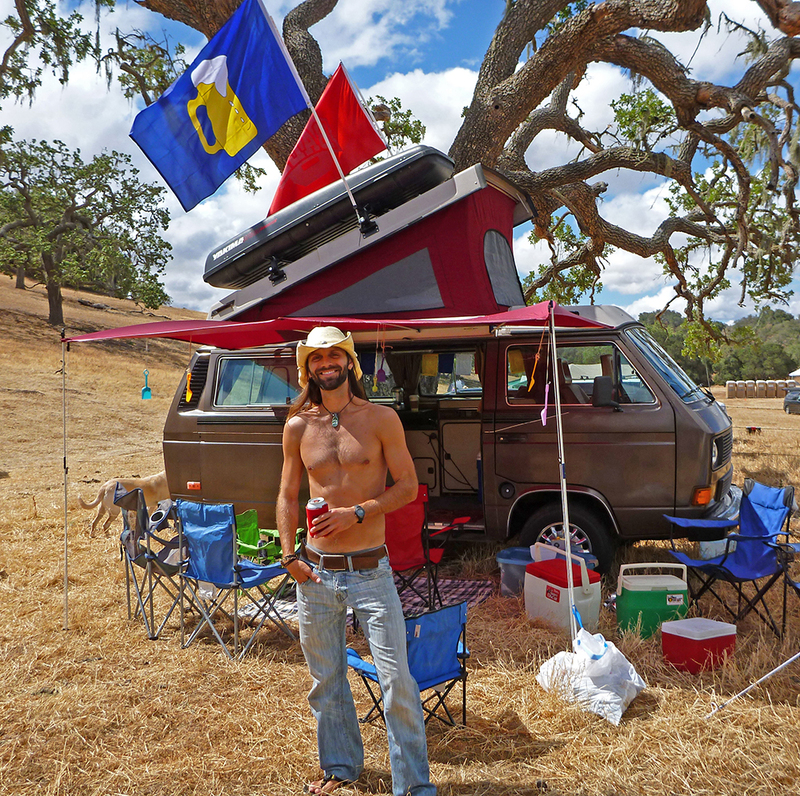 Tantor and the ultimate vanlife setup! Finally, Tantor came with some pretty sweet upgrades. First, the pop top canvas had been replaced and the previous owner picked dark red. 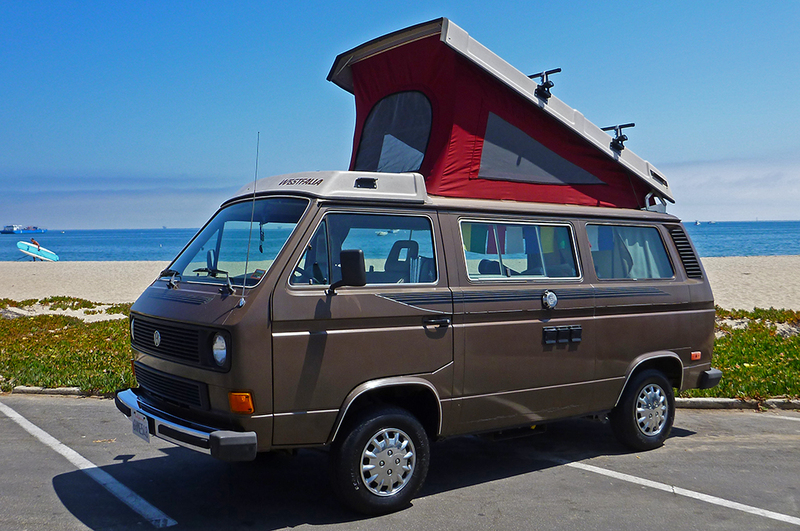 At first I wasn’t a huge fan, but it grew on me and this may very well be the only dark brown Vanagon Westfalia with dark red highlights. They also added an awning above the sliding door that is deep red and extends the living space to a excellent patio for camping. Two full size camp chairs came with the van, which were a huge upgrade to the tiny child sized chairs I toted around in The Silver Bullet. Overall, I will miss The Silver Bullet, but the Westfalia is much more liveable, fun to drive, and is a great conversation starter where ever I park. So there you have it folks, my new home on wheels, Tantor! If you see a slow moving brown behemoth with a Yakima storage box and Tibetan Prayer Flags waving in the window feel free to pass by and throw up the peace sign. I’ll smile and wave. You will probably get to where you are going much faster than I will, but I’m in no hurry. Me and Tantor are just taking it easy, driving at the speed of life. Love it. You inspire me. Recently got a camper myself but haven’t given up the house yet. Thinking of giving it to my son and going on the road. Best to you and enjoyed the read. 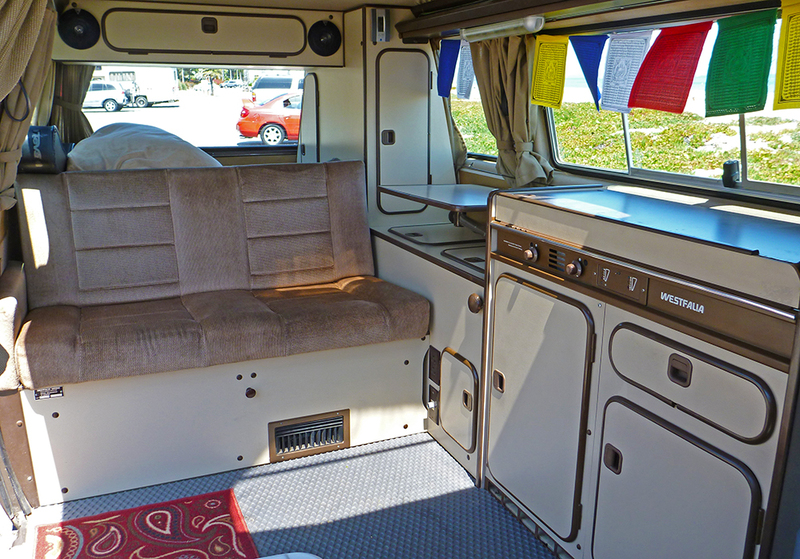 Wow, that’s a very clean Westy. Had one for 10 years but gomt tired of life at 45 mph :). Don’t know how much you know about Vanagons so here are two resources when! you need parts. Vanagain and Bus Boys. There is also a very active listserv for Westys but I can’t remember the url. Enjoy it, they’re very livable. Tarzan – loved the post and your flexibility. Your trail name “Tarzan” was well-earned by your ability to travel like Edgar Rice Burroughs’ fictional hero fast and hard, disappearing into the “jungle” with stealth to almost magically re-appear somewhere else. We all assumed that, like Tarzan, you traveled through the tree tops. Now the truth comes out: on the Appalachian Trail you had an elephant?? Hey man, love your site and your YouTube clips. 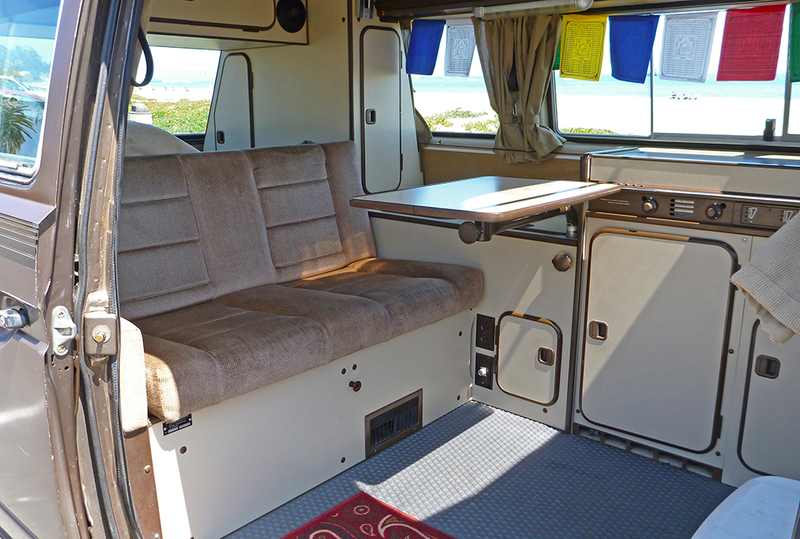 It has been a passion of mine to travel in a mid 80s westy for some time now. Still searching for a van that fits me, but I’ll be there soon! Hopefully I see you on the road one day and we can crack a beer together. I’ve really enjoyed reading your blog! I am on the 1-year plan to save some money, ditch the office job and hit the road in my Honda Element. Your lifestyle makes for great inspiration! I will definitely use some of your Silver Bullet design ideas, great use of space! Keep it up! Thanks for the message Joelle! Good luck, enjoy the journey! It’s definitely not easy, but I believe it’s worth it!